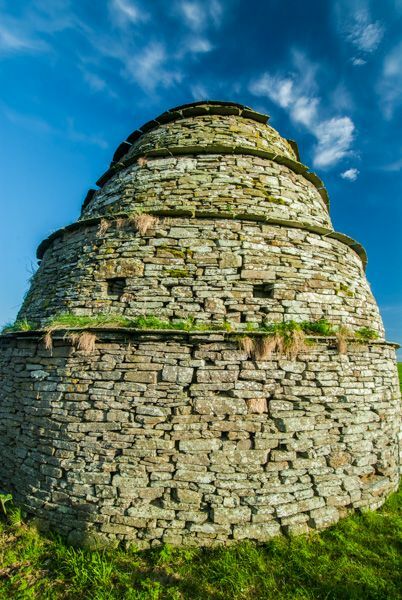 A striking doocot (dovecote) built in 1648 for the lairds of the Hall of Rendall. 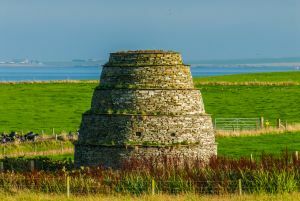 It is built in a conical beehive style, with four string courses projecting at regular intervals from the 4-foot-thick exterior walls. The string courses were a measure to prevent rats climbing the walls and getting in through the pigeon access holes at the top. The design is best described as similar to a wedding cake, rising in concentric layers, each smaller than the last. 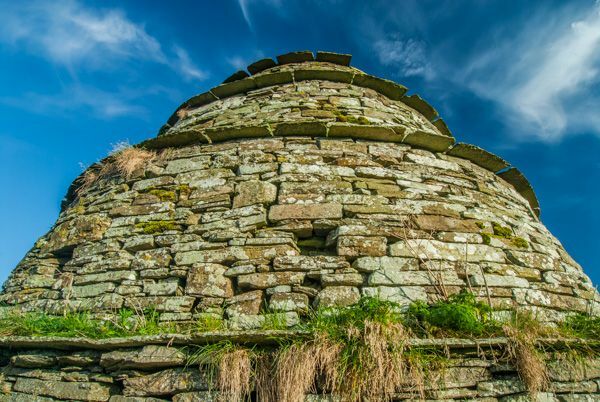 What makes the Rendall Doocot so interesting is that most doocots on Orkney were built as a rectangle, or to a square plan, with a lean-to roof. Access is easy; just take the signed drive to Hall of Rendall off Gorseness Road, between Gorseness and the Tingwall ferry. There is a small parking area and the doocot is easily visible from the drive. 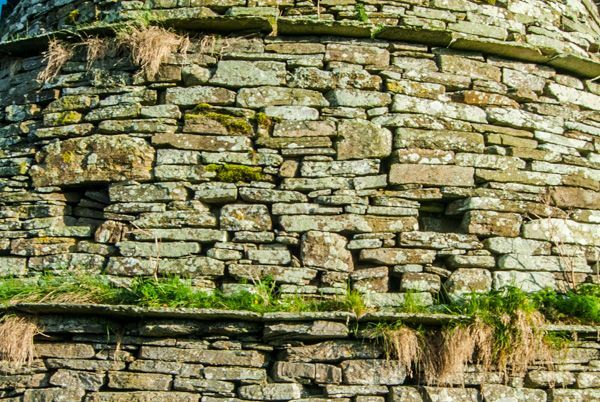 Access is limited to exterior views, as the doocot is still used by local birds. Please be careful not to alarm the birds when approaching the building. I thought the doocot was quite striking because of its unusual design, though it is a shame there was no internal access to see the nesting boxes. Location: Down a small lane, accessed off the A966. The doocot is signposted and there is a small parking area, with a very short walk to the doocot. Nearby accommodation is calculated 'as the crow flies' from Rendall Doocot. 'Nearest' may involve a long drive up and down glens or, if you are near the coast, may include a ferry ride! Please check the property map to make sure the location is right for you.